Introducing NEW Natrol® Hair, Skin & Nials Gummies, the deliciously good Gummies you can feel deliciously good about! Natrol Hair, Skin & Nails Gummies deliver 5,000 mcg of biotin in just two gummies, making them one of the most nutrient-dense Hair, Skin & Nails gummies available. HSN Gummies are 90% organic, made with organic sweeteners, non-GMO, vegetarian and gelatin-free (no animal byproducts), and are free of artificial flavors, sweeteners, colors and preservatives. Because they are pectin-based, they are vegetarian and less likely to stick to your teeth and to the bottle than standard gelatin gummies. 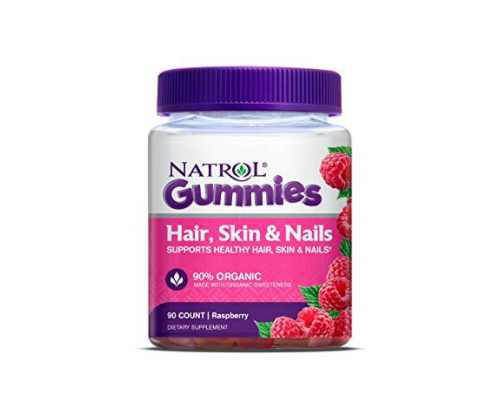 Natrol Hair, Skin & Nails Gummies are available in a great-tasting raspberry flavor.